Gian Piero Gasperini was appointed as Atalanta coach in the summer and his coaching mixed with the players at his disposal has seen the Bergamo-club rise to the top of Serie A. Following a truly spectacular campaign, Atalanta finished fourth in the table, a position which saw them qualify for next season’s Europa League as well as being their highest ever league position. It represents a remarkable achievement for a team expected to finish in mid table or the lower half of the league. At the beginning of his tenure Gasperini implemented his famous 3-4-3-system and initially used the experienced players in the squad. However, after four defeats in the first five games, the Italian tactician gambled ahead of a home game with Napoli and fielded a very young side against Maurizio Sarri’s swashbuckling team. Young academy players Mattia Caldara, Roberto Gagliardini and Andrea Conti were joined by fellow youngsters Remo Freuler and Andrea Petagna in the eleven. Gasperini were duly rewarded with a spirited performance from his side that beat Napoli 1-0 in an impressive display. That win was the second in a row and became the base for a terrific run of nine games without a loss and of the nine games eight were wins. Despite that run of form ending away at Juventus in a 3-1 loss, Atalanta has been very consistent and continues to impress. Young players like Caldara, Conti, Freuler, Petagna, Leonardo Spinazzola and the peerless Franck Kessie have impressed throughout. The aforementioned Gagliardini has already signed for Inter while Caldara will join Juventus in 2018. Kessie is also certain to move in the summer. These youngsters have worked brilliantly with more experienced players like Rafael Toloi, Jasmin Kurtic and Alejandro Gomez and we’re seeing the best Gasperini team he’s ever assembled. Atalanta use a 3-4-1-2/5-2-1-2 shape when defending with Kurtic positioned behind Gomez and Petagna. Three centre backs are joined by the wing backs when the team defends deep and they have two central midfielders. The defensive shape can be seen below. In attack, the shape becomes 3-4-3 or 3-4-2-1 as Kurtic (yellow) moves into the right half space and Gomez (yellow) into the left half space with Petagna acting as the sole central striker. The wing backs (circled in red) provide fantastic width, and the attacking shape naturally forms triangles and diamonds across the pitch. Atalanta normally defends in a very man-orientated manner with almost the entire team often man-marking their opponents closely. This naturally affects their defensive shape, but the standard defensive shape is 3-4-1-2 or 5-2-1-2. In the video below you can see how the whole man-mark Juventus and the speed and intensity the Atalanta-players shifts across the pitch. Also note the way the centre backs leave the defensive line to mark their closest opponent, further highlighting their man-marking approach. This aggressive man-marking approach across the pitch worked as Atalanta earned a 2-2 draw against the champions. When they played Napoli, however, they had a different approach however. 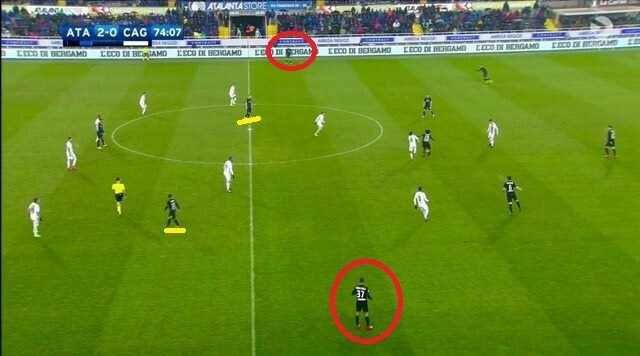 It’s illustrated in the video below where they man-marked centrally but left Napoli’s full-backs free. When Roma came to Bergamo, they dominated the first half and led comfortably at the break. In the second half though, Gasperini made some attacking substitutions, notably moving Franck Kessie to the attack, and sent his team out with an intensity Roma couldn’t handle. In the video below it’s clear to see the intense, man-orientated pressing from the home players which makes Roma lose the ball and Atalanta initiating an attack of their own. The strong pressing and counterpressing of Atalanta saw them dominate the second half and eventually won the game 2-1. Atalanta’s defending has been good all season, and their man-marking approach has seen usually strong possession sides such as Juventus, Napoli, Roma, Inter and Torino struggle with their passing game against the energetic and intense pressing of Gasperini’s men. Atalanta are also very good in counterpressing, as they are quick and aggressive when closing down in a man-orientated manner. In the video below we see how they lose the ball but the closest players press immediately to regain possession. In possession, Gasperini advocates positional play when building attacks. The back three, the two central midfielders and the two wing backs are responsible of circulating the ball to create opportunities to move the ball into the attacking midfielders who then can progress the game forward from positions behind the oppositions midfield where they usually receive the ball in either half-space. Positional play concepts such as the third man and the free man are always evident in their construction of possession. Note how Kessie’s disguised pass finds the free man Kurtic in the right half-space to then progress the play down the right. Atalanta are also confident in tight spaces where they quickly combine to get out of pressure. You can see this in the video below, but if there is no option they’re not afraid to go long and find runners in behind the oppositions defence. Below we see the team dominating possession away at Torino. The Atalanta players quickly pass the ball between each other and thereby forces Torino to constantly move. Passes go both around and through Torino as Atalanta look to create openings. In this video they successfully do so, but the final ball lets the team down. Note how the fantastic width provided by Conti and Spinazzola down the sides enable Atalanta to use four central players in front of and in behind Torino’s midfield. The spacing of the back three ensures Atalanta always have a solid base to build from. The strong positional play of Atalanta can see them dominate possession when they want which sees them rarely relinquish leads as they usually appear in total control of the games. The movement between players in different zones and spaces to create passing options is extremely impressive as the players often move freely to find good positions to receive the ball in. Third man runs is a key part of the passing game too. Atalanta often look to overload around the ball to attract opposition to one side before quickly switching sides. On this occasion, Atalanta overload on the right before finding Kessie in a position between the oppositions midfield and defensive line and create a third man run from Kurtic down the right. Atalanta either look to progress the play down the sides, which we’ll come to later, or by finding the free man behind the oppositions midfield. In the video below, they open up a passing lane from the centre-back to Gomez who can turn and attack the back-four. Apart from the strong positional structure and the effective possession-play Atalanta’s main source for change creation comes from their impressive wing play. The 3-4-3 shape means the wing backs, most often Andrea Conti and Leonardo Spinazzola, naturally provide width down both sides with the attacking midfielders Kurtic and Gomez positioned in either half-space. However, while the movement between Kurtic and Conti on the right is straightforward with Conti always wide, Gomez and Spinazzola on the left combine and pick up different positions. Most often, Spinazzola will be wide with Gomez centrally, but on occasions the Argentine maverick will move wide and Spinazzola will therefore move centrally. In the video below Atalanta move the ball from the left to the right to create a 1 vs 1 situation for Conti which results in a low cross and a well-worked goal. The key is through the quick shift of play starting with Spinazzola’s diagonal run in centrally and Kurtic half-space positioning. Below is another video of a strong switch of play from left to right which leads to a goal. On this occasion, Gomez found space in front of the defence and played a diagonal through pass for Conti who finished emphatically. Diagonal passing is another feature of Atalanta’s play and their quality in switching sides with the ball at pace is evidently very difficult to defend. Here we see Gomez drifting inside with the ball and Spinazzola coming on the overlap. A swift cutback is played to Kurtic who really should finish better, but once again an example of the strong wide play from Gasperini’s side. The overlapping runs from Spinazzola outside of Gomez has helped the Argentine as Spinazzola attracts attention from defenders with his pacy runs from deep. On this occasion, Gomez took advantage of the defender standing off him as he was aware of Spinazzola’s overlap which gave Gomez enough time to finish. We finish this section with another goal. Ball is played into a wide area from where a cross is delivered into Freuler who scores beautifully. The wide play is the key source of Atalanta’s chance creation. However, there’s different ways of going about trying to create chances from wide play. Crosses from the sides are very rare from Atalanta and they have statistical backing of not using that approach. Crosses from the sidelines have a one in seven chance, or 14 %, to even create a goal scoring opportunity. If the final pass comes about ten yards closer to the central area, however, the chance of creating a goal scoring opportunity increases to one in three, or 33 %. Therefore, it makes sense to see Atalanta focus on creating chances via cutbacks as you can clearly see in the video below. With players like Alejandro Gomez, Franck Kessie, Jasmin Kurtic and Remo Freuler in the ranks, it’s no surprise to see some impressive combination play in central areas. Kessie and Gomez in particular have creativity in abundance and Gomez has sparkled in his best ever season with 16 goals and 12 assists this season. Below we see the way Kurtic, Kessie and Conti combine to set up Petagna’s goal at Torino. Here we see Gomez, Petagna and Freuler combine for a brilliant goal using excellent movement and combination play. Atalanta also have the possibility of sitting deep in a 5-3-2 or 5-4-1 block to soak up pressure and then counterattacking at pace. 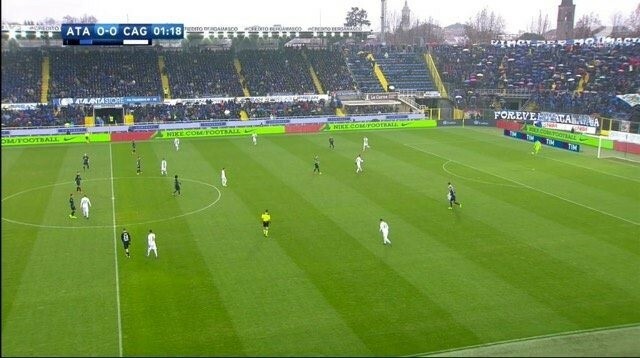 They did this effectively away at Napoli when 1-0 up and a man down. Here we see a superb counterattack finished by the centre-back Caldara to clinch the win at Napoli. Atalanta has surprised everyone this season by finishing fourth and securing Europa League-qualification for next year. Gian Piero Gasperini’s excellent tactical setup has created a multifaceted young team that can play in different styles and have plenty of ways to create chances and score goals. The attacking setup is almost complete and coupled with the energy and intensity the team presses and defends with Gasperini has created a terrific young side.